GALION — Galionite and Vietnam War veteran Glen Hess is still busy making lifetime memories. Hess served in the U.S. Army from October 1968 to October 1970. He was drafted twice, but not called to serve until his second draft call. He completed his basic training at Fort Bragg and was sent to Phubia, Vietnam for 12 months. Hess worked in light artillery. “It’s truly an honor to be able to serve the United States,” he said. While Hess has spent the majority of his life in Galion, he was born and grew up in Raven, Virginia. After he was in a mining accident in 1972, his doctors wanted to put him on disability. That wasn’t a fate that Hess was willing to accept. After just a day and a half in Galion, Hess was given a job at Peabody. He was eventually laid off, and later took a position as a bus driver for Mansfield City Schools. He retired from his position as a bus driver in 2005, after 25 years of employment. A couple years ago, Hess looked into the Honor Flight process and sent in his application. He learned earlier this year that he had been selected to be on a flight to Washington D.C. on May 19. Hess got to share the experience with two other local veterans. Ken Parr of Crestline and Tom Heinlen from Bucyrus were selected to be on the same flight with Hess. 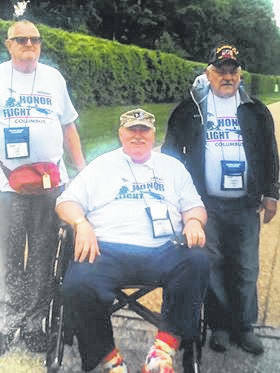 The Honor Flight trip is a quick, but memorable one for the veterans who are chosen. Veterans are asked to be at the airport by 5:30 am the day of their scheduled flight to attend breakfast as a group, prior to boarding a plane to Baltimore, Maryland. Upon landing in Baltimore, the travelers are put on buses for the remaining travel into Washington D.C.
Once they arrive in D.C., the whirlwind trip moved the veterans from Arlington National Cemetery, to the World War II Monuments well as the Korea and Vietnam monuments. “It’s unbelievable. Such a great opportunity,” Hess said of his first trip to Washington. An important part of that reception crowd was Hess’s daughter and grandchildren. The entire experience made a huge impact on Hess who says the memory of the Honor Flight will stay with him the rest of his life.